Homemade hummus is a luxury. It's smooth, warm, and mega flavor party in your mouth. It makes an impressive appetizer for entertaining, and can be a bed for cool toppings like tabbouleh as in Minimalist Baker's Shawarma Dip (a big hit at the NBA draft party I went to earlier this summer). In a blind taste test (with many design flaws including lack of standardization, full disclosure! ), my man enjoyed hummus #2 the best. My fave was the OG #3 but they were all so good I'll probably keep making #1 or #2 since it was fast. Soaking beans takes zero extra hands on time, you just need to have the beans ahead of time. 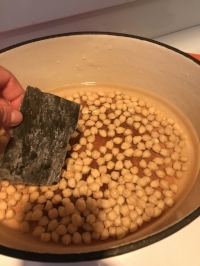 I added kombu seaweed to the beans which is said to help them digest better due to the minerals/enzymes in the seaweed. I'm obsessed with sea veggies because I love all things Asian, plus they have sodium, potassium, calcium, magnesium, iron, phosphorus and other trace minerals that we need for healthy bones and electrolyte balance. You can find kombu in the Asian section of Whole Foods or on Amazon here. I hope you enjoy this cooking science experiment, feel empowered to make your own and ditch the can! Requires planning and several hours. But it becomes a "pro" when you make it a good weekend project while you clean and do laundry. 1. 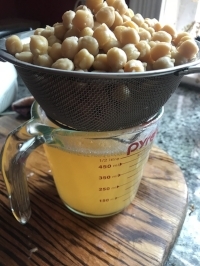 Rinse/drain chickpeas in a mesh strainer and add to instant pot with 4 cups water and 1 sheet kombu. Close lid and make sure vent is set to "sealed" position. 2. Set to manual high pressure, 35 minutes. 3. When time is done, allow full natural pressure release (takes about 25 minutes). If you are short on time, allow natural pressure release for 15 minutes and then do a quick pressure release. 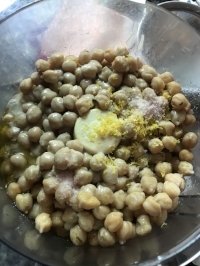 4. save 1/2 cup chickpea liquid, discard kombu seaweed and drain beans. 5. 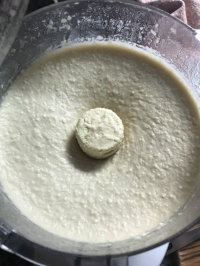 In food processor, pulse beans into paste. With blade running, add tahini, lemon juice, olive oil, garlic, salt. Lastly, add chickpea liquid slowly until you reach a texture you like (might need more or less liquid). Taste and adjust seasoning. 6. serve warm, make a center indent with a spoon and pour in a puddle of evoo. Serve with sliced cukes, warm sourdough bread, seaweed crisps, par-boiled carrots, or tender lettuce cups. 1. 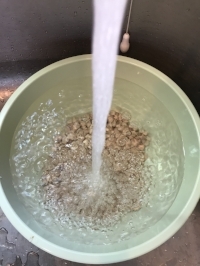 Rinse/drain dried chickpeas then place in large bowl and fill with cold water. Cover with tea towel 8-12 hours or overnight. 2. Rinse/drain and follow instructions for method 1, but decrease instant pot time to 25 minutes. 2. Rinse/drain and place in large pot, cover with several inches of cold water, add kombu seaweed to the pot. 3. Bring to boil and reduce heat to simmer. Cook until beans are tender and can easily be mashed with a fork (took me over 2 hours). Skim off any foam. Where does Ayurveda fit in? Fresh food has more prana or life force. Canned or packaged food lacks prana and increases tamas, which can lead to heaviness or dullness in the body, skin, and the mind. Eating foods with high prana like fresh fruits and vegetables and homemade food infuses your body and mind with more vitality and creativity. Vata: if you have a vata constitution, you have erratic digestion, tend towards gas with beans, or tend to feel anxious or overwhelmed, definitely eat this warm. Serve with fresh sourdough bread or as a topping for steamed veggies (think warm and cooked, not cold and raw). Pitta: if you are a pitta constitution, you have strong digestion, you tend towards inflammed or red skin rashes, and your mind is sharp and sometimes critical, balance your internal heat with things that cool, like bitter greens and veggies. Serve hummus on sliced cukes, roasted beets, baby spinach, or red leaf lettuce boats. Kapha: if you are a kapha consitution, feel congested, have extra weight, sluggish digestion, or feel foggy or dull, balance with light, dry and pungent. Seaweed crisps, bitter greens, steamed broccoli, or steamed collard wraps are best for you.